If you are getting married in a foreign country you may need to have your Divorce Certificate authenticated and legalized. The validation process of Divorce Certificate Authentication Legalization may also be called a Divorce Certificate Apostille or Attestation in other countries but is recognized as the equivalent. Authenticating and Legalizing a Divorce Certificate with us is easy. Let’s get started with the why and how. If you are being asked for a Divorce Certificate Apostille, it is from a country who has signed the Hague Convention which Canada has not; Canada does not have an apostille process as a result. The important thing to remember is that if you complete the two step authentication and legalization process, your Divorce Certificate will be accepted as valid; equivalent to an apostille. There are many reasons why you may have been asked to get Divorce Certificate Authentication Legalization or Divorce Certificate Apostille. Whatever the reason, we can help. Global Affairs Canada Authentication Services Section can authenticate an original or a certified copy of a Divorce Certificate issued by the provincial court where the divorce application was filed. It’s important to remember that you will need the spelling of the name of the court official who signed the Divorce Certificate. If you are unable to confirm the spelling of the signature on the certificate, you can contact the court that issued it they will assist you with this. To help get you started, you can find links to all the provincial court websites on our Document Authentication Resources page. As an alternative to using your original documents we can authenticate a certified copy made by a Canadian notary public. Some of our clients prefer to keep the originals for future use. If you need help with this ask us about our Notary Services. As an alternative, or of you have misplaced the original, you may be able to request that the court issue a new divorce certificate for the authentication and legalization process. You can find the links to the provincial court houses on our documents resources page. The second step of Divorce Certificate Legalization takes place at the embassy consulate of the country where you are going to be using it. Most embassy consulates are located here in Ottawa and charge a fee to provide document legalization services. In addition, some have other requirements or processing times that change often. But not to worry, our divorce certificate legalization services will take care of all of that. We make sure it gets done correctly and meets your timeline. 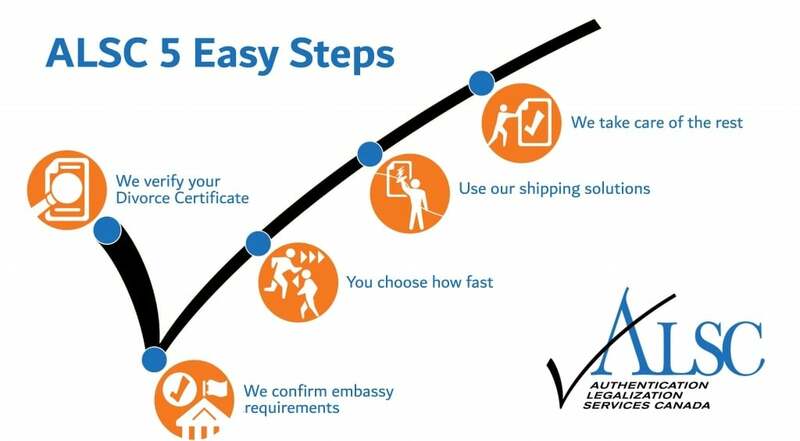 After the Divorce Certificate has been authenticated and legalized we can return it back to you or anywhere in the world it needs to go using one of our document shipping made easy solutions or using your preferred delivery method. If you have been asked to get a Divorce Certificate Authenticated and Legalized or Apostilled, you may have other documents like a Birth Certificate, Marriage Certificate, or Power of Attorney that also require authentication and legalization. We can help you authenticate and legalize these and other documents when you use our Quick & Easy Verification on our home page. Now that we have helped confirm that you have the correct type of Divorce Certificate, you are ready to begin the Divorce Certificate Authentication and Legalization process also known as Divorce Certificate Apostille Certification. Find out how easy it is using our services!